Unusually good cask choice. Keep it up please. Gypsy Hill - Inspector 4.50 Colman with Boxcar this was supposed to be a fruited mild but it tasted like a sour! Crossborders - Hop Series Pale 3.80 Unfiltered and murky. Muddled hop profile. RedWillow - Effortless 3.70 Cracking NZ Pale Ale. Drizzly night. Loudish, tortured music. Fyne - Jarl 3.80 Bordering 5*. Very quiet. Table service as the bar top was being refurbished. Box Social - Gentleman's Nectar Pale Ale 4.20 Slightly astringent pale ale. Busy. Restrained music. Excellent, friendly service. Box Social - Lips Like Morphine 4.50 Refreshing and restrained saison. Box Social - Staring at Squirrels 4.80 Been on a week. At or past the point of turn. Happy to report the young lady behind the bar welcoming, knowledgeable and enthusiastic. Box Social - Staring at Squirrels 4.80 Pungent and fruity NEIPA. 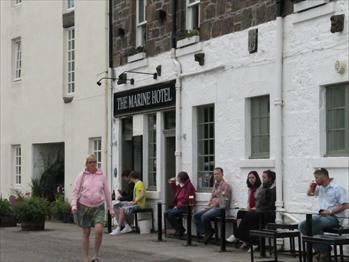 The pub is found in Stonehaven, Aberdeenshire, AB39 2JY. Freehouse enjoying a fantastic harbour side location in Stonehaven's conservation area. 5 or 6 real ales, with an emphasis on Scottish micros; the house beer, Dunottar Ale, comes from Inveralmond. Excellent selection of bottled beers especially from Belgium plus interesting kegs which may be from Westmalle, Kwak or De Koninck. 2009 CAMRA Scottish Pub of the Year. We have visited this pub 242 times, seen 354 different beers and tried 194 of them.